You can change an image’s size and resolution in a couple different ways within Photoshop Elements 11. One method involves the Image Size dialog box, which you use in many of your editing sessions in Elements. For these steps, you can use any photo you have handy. Alternatively, you press Ctrl+Alt+I (Command+Option+I on a Mac). The Image Size dialog box opens. 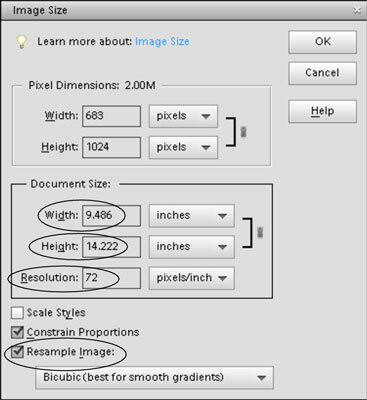 The Pixel Dimensions area in the Image Size dialog box shows the file size (such as 18.2MB [megabytes]). This number is the amount of space the image takes up on your hard drive. The width and height values are fixed unless you select the Resample Image check box at the bottom of the dialog box. In the Document Size area, redefine the dimensions and resolution. Width: Type a value in the text box to resize the image’s width; then, to implement the change, press Tab to move out of the field. From the drop-down list to the right of the text box, you can select a unit of measure: percent, inches, centimeters, millimeters, points, picas, or columns. Height: The Height options are the same as the Width options except there is no column setting. If you keep the sizing proportional — by selecting the Constrain Proportions check box — you typically edit either the Width or Height text box, but not both. When you alter either width or height, the resolution changes inversely. Resolution: Edit the text box to change resolution and press the Tab key to change the value. When you edit resolution, the Width and Height values are changed inversely (if the Constrain Proportions check box is selected). With this check box selected, you can change dimensions and pixels at the same time, which results in reducing or increasing the number of pixels. When the check box is deselected, the values for dimensions are linked. Changing one value automatically changes the other values. If you select the Resample Image check box, choose a resampling method as well as other resampling options. Scale Styles: Elements has a Styles panel from which you can apply a variety of style effects to images. When you apply a style, such as a frame border, the border appears at a defined width. When you select the Scale Styles box and then resize the image, the Styles effect is also resized. Leaving the check box deselected keeps the style at the same size when the image is resized. Constrain Proportions: By default, this check box is selected; keep it that way unless you want to distort an image intentionally. When you’re done selecting your options, click OK to resize your image. methods, leave the default at Bicubic. to work best if you have to upsample an image.